Update 2.4 is live! The update became part of the game Tuesday, October 1st. There are already a lot of mixed reviews. I have only been able to sample a small bit of the new update, and despite the bugs, I’m happy with some of the new content. Last night, I accepted the quest on fleet and then set off for Oricon. I will get into some of my first impressions of Oricon. We will take a look at the patch notes and discuss some of the changes in 2.4 in this week’s HoloNet Links. It is time for another edition of CRR’s HoloNet Links. 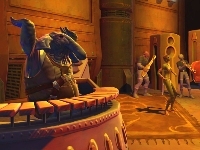 There have been several interesting bits of news, regarding SWTOR, to come out since last Thursday’s article. We now know that Update 2.4 will be the conclusion to the Dread Masters story arc. We know the Baron Deathmark appreciates all of those crazy Huttball fans that showed him support over the years. Of course, some of the biggest news came in small thumbdrives during Gamescom at the Community Cantina in Germany. I’m back! It was a great time in Chicago taking in Comic-Con and also going to the SWTOR Community Cantina! Yes, yours truly got to attend the Community Cantina at Chicago. Although, I was a bit late, due to traffic and a long wait in a parking garage…I made it to the event! It was a blast! There were several people there. Amber Green, Eric Musco and Jesse Sky were some of those in attendance. The place was pretty packed, but all of the BioWare employees were great with their time, listening to questions, concerns, and even exchanging fun stories. Welcome to the war, comrades. Let’s get to the briefing. Today, we take a look back at PvP in SWTOR and discuss changes coming in the summer.